Zadro Next Generation LED Lighted Travel 1x/10x Mirror from HealthyKin.com allows you to illuminate one mirror or both mirrors. Light enough to travel with at only 0.6 lbs. Lifetime "Eco-Friendly" LED bulbs never need replacing. Fully height and angle adjustable. Unit size 11.5"H x 4.5"L. Folds to 1½" deep. Mirror size 3¾". No power cord needed. Battery operated using 3 AAA batteries (not included). Battery life of up to one year with regular use. 10x/1x Magnification. 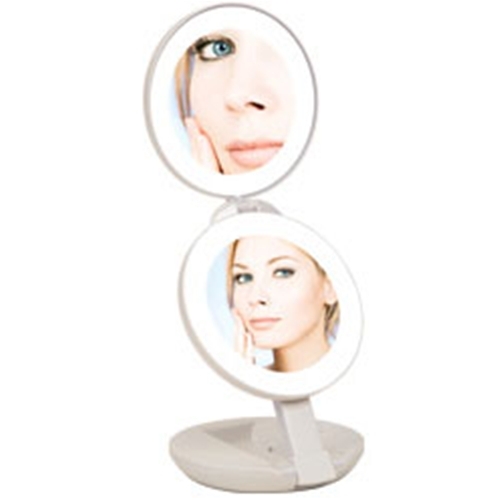 I love their regular size lighted mirrors they are actually the most clear mirrors I've ever used and I'm 56 years old and have always used a lifted mirror since the 70's! This one is for travel and I found the size of the circle way too small the light is good but the circumference too small.... I'm sorry! !